It's been one of those nights when things just haven't gone as they should. Remember how once upon a time, in the olden days when you played records on a record player and you could adjust the speeds..... kind of feeling like my speed is a little off... or a film that has been dubbed and the dialogue and actors lips just don't quite match up. Firstly, WELCOME to the two new lovely ladies joining the blogsite. Still getting my style together, and keeping a close on on Jane from http://www.lifeonplanetbaby.com/ and Sarah from http://mollysmaison.blogspot.com.au/ for blogging tips. What heritage do I frequently draw on for inspiration? Email your answer to thesnowqueen1@hotmail.com before 6pm Sunday, 29 thJuly (AEST) to be in the running. The winner will then be announced on this blogsite at 9pm (children and bedtimes willing) the same night. This is to be compliant with Facebook guidelines on promotions, and Facebook is in no way responsible or involved in this promotion. Whew! So what do you win???????? 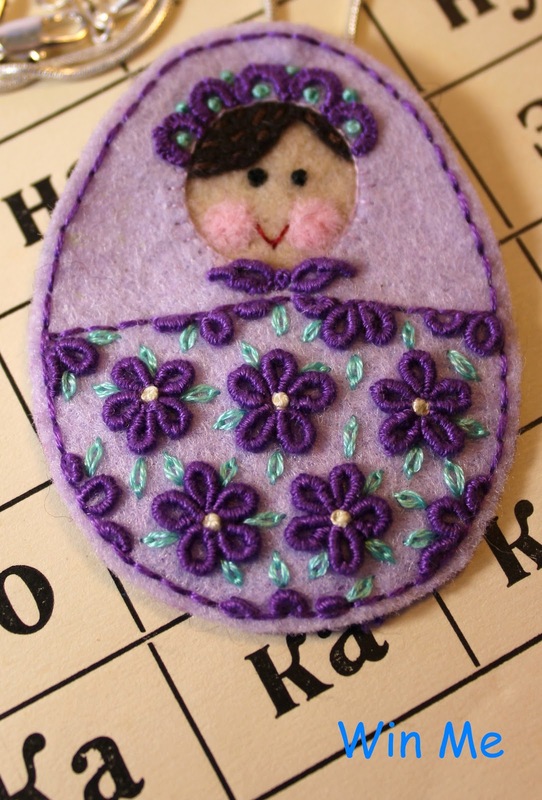 A lovely little matryoshka maiden in pale lilac. She is made with Eco Felt (from post consumer plastic bottles) and completely hand stitched. She is about 6.5cm tall and 5cm across the widest point. On the back, she is mounted with a silver brooch pin and bail - so you can wear her as a necklace or a brooch. All you need to do is slip her on your favourite chain, thread a ribbon through the bail, pin her to a ribbon...... leave it to your imagination. She comes mounted on a recycled, handstamped card backing and is the LAST one of this series I plan to do! Best of luck lovelies, I am off to do the dishes. The Snow Queen's Garden specialises in one of a kind, hand crafted decorations. Drawing on a rich Russian/German heritage, The Snow Queen's Garden is known for handembroidered Babushka inspired dolls. Ethereal theme. Theme images by micheldenijs. Powered by Blogger.